LIFE as a student and an athlete was challenging for the Correctional Services Queens player Lorraine ‘Loloe’ Manjoro but unfaltering passion and perseverance pushed her to the stars. Despite being raised by a single mother who later passed on when she was only eight years old, the 25-year-old multi-talented sports personality continues to hit milestones. A holder of a Bachelor of Science Honours in Environmental Science and Health degree with the National University of Science and Technology (NUST), she owes her success to God. SG: Who is Lorraine Manjoro? LM: Born 1993 in Guruve, I was raised by a single mother up until May 2002 when she passed on. I moved to Makumbi Mission where I did my grade four up to Advance Level. In 2012 I moved to Bulawayo to study at the National University of Science and Technology. SG: What lessons did you draw from being raised by a single parent? LM: The fact that my mom could sustain me and my siblings taught me to be a hard-worker, to appreciate the little handed to me and a nurturing spirit to care for the well-being of others. SG: How did you manage to balance between sports, academics and social life? LM: There are 24 hours in a day during which many things can be done. The trick was doing sports during sports time and school work during school time. There were sacrifices made, I had to let go of sleep and put relationship stuff on hold. SG: What was your biggest challenge growing up, be it socially or otherwise? LM: Probably the fact that education was just the norm in the family and I was too serious about sports in high school I had support of a few family members. Even when I started working there was criticism that I was letting go of my education career and choosing sport. It was painful coming from family and peers but yeah I knew I could do both so I did it anyway. SG: What can you say to people who think many athletes are not learned? LM: Let’s move away from that paradigm. Not everyone who does sports is not learned, most people are learned but just choose to pursue their sports careers. Being athletes is not just a job it’s a passion, it’s part of us regardless of having degrees. SG: How and when did your netball career start? 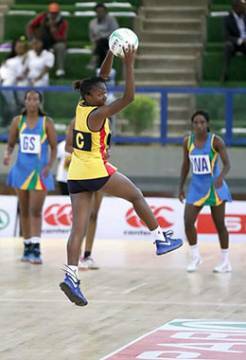 LM: I started playing netball when I was in grade four at Makumbi Primary School in Domboshava. Later on I moved to Visitation for my high school where I got accolades at school, district and provincial level which led to me representing Mashonaland East at youth games where I met some of the great faces in netball who helped shape my career notably coaches Menfree Tanyanyiwa, Moreblessing Nyambara, Ninja, Tapiwa Chirenda and Ropafadzo Mutsauki. 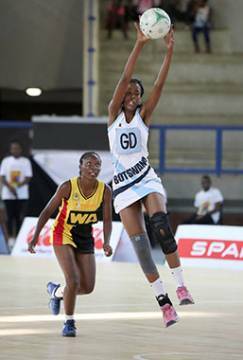 My big break in netball was in 2012 when I was playing for Freestars in Bulawayo under Coach Menfree and there was a ZINA Southern Region end of year tournament where I got the best goal attacker of the tournament. That’s when Khami Queens announced they were joining the Super League and a week later I got a call that I was one of the players they had drafted. I got the privilege to be recruited by the then Zimbabwe Prison Service and ever since then it’s been a wonderful journey. SG: What interested you in sport? LM: There is a sense of belonging to a group of people who have the same vision and goals as you in life which creates unity and teaches you to work well in a group setting. Sport teaches you discipline and definitely gives you the opportunity to see the world if taken seriously. SG: Besides netball what other sport are you involved in? LM: Basketball, I was mostly active in it during my college days playing in the Bulawayo league. In April 2018 I also played cricket for NUST during the ZUSA games. SG: What has been your greatest moment in sport so far? 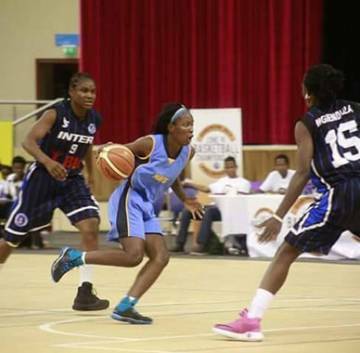 LM: Representing African Universities at the 2016 FISU 3×3 Basketball World Universities Championships in Xiamen, China and representing Zimbabwe at the Diamond Challenge in South Africa last year in November. SG: How did you feel when you were called to the national team last year? LM: I felt very honoured and excited to be in the final squad. SG: How do you rate your performance during your debut appearance with the Gems? LM: I would probably rate myself five out of 10 -not being modest- but well if other players and coaches feedback and review is anything to go by, it was pretty way better than what I thought of myself. There is room for improvement though. SG: Where do you see yourself in the next five years? LM: I see myself contributing more to the society than I am doing right now and being a better version of myself in every aspect of my life be it religiously, academically, in sports, family, and finances. SG: Who is your netball role model, locally or internationally and why? LM: Locally, my role model is the younger Gems vice-captain Felisitus Kwangwa because she has shown me great mental strength over the years encountering so much in her journey ever since her first call up in the national team. Internationally that will have to be South Africa’s Proteas captain, Bongiwe Msomi. She just has the physical strength that I love as a midfielder and as a black person like me, it’s relatable and it shows I can also achieve the same if I work harder to maximum potential. SG: What is your advice to aspiring young athletes? LM: Being a student athlete means you are a student in the classroom and then an athlete in the playing field. You can be both in life don’t let people’s words stop you from pursuing your academic and sporting careers because it is possible. Have great mental and physical strength and you will be great athletes. If you are in a team sport, know that no one is greater than the team we all need each other to win the game. Talent without hard work is wasted talent, challenge yourselves to be better. Talent and hard work without God is wasted sweat. SG: What are you looking forward to ahead of the new season with the Correctional Queens?